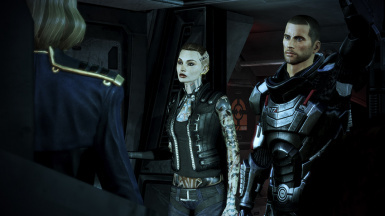 UPDATE 4/25/15: Hey folks, I've released a updated version of the Casual Jack mod, version 1.2 - with this new release, the mod is now 100% compatible with both the JohnP's Alternate MEHEM (JAM) mod and the Mass Effect Happy Ending Mod (MEHEM), as well as being completely compatible with ME3Explorer's Texplorer program. To updated to the new mod, just delete the old DLC_CON_Jack folder from your DLC folder and add the new release if you are using JAM with the previous Casual Jack JAM patch, I highly recommend deleting the DLC_CON_JAM folder and reinstalling the JAM mod. I installed the mod but didn't like it. As soon as I could save and quit I did and removed the DLC folder from my game and re-ran AutoTOC from Mod Manager. 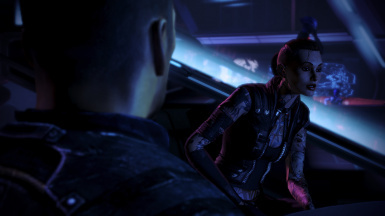 Jack was back to her ME3 look for the remainder of Grissom, but in the scene in the shuttle, she was completely black from the neck down. The FAQ says it doesn't affect the Citadel DLC, so I imagine everything will be cool when she shows back up, but wanted to check in to see if anyone else had removed the mod mid-run and encountered any other complications. I'm also running ALOT. This mod doesn't appear to work correctly 100%. It works fine for most of the Grissom Academy mission but the final area in the docking bay, for some reason Jack reverts to her default 'toilet paper' appearance. From looking at the files in the DLC folder it looks like there needs to be a version of the characters' models for each scene they're in. I'm guessing the file: BioD_OmgJck_600DockBay , for whatever reason, is now out of date/incompatible with the currently patched version of ME3. Any chance you can take a look at this and fix that last file, AVPen? I haven't got far enough in the game to test the other ones. I confirmed that the mod's "BioD_OmgJck_600DockBay" file is fine - I'm guessing that either you somehow deleted the file from the mod or that you're using another mod with a higher mount priority that overwrites the changes of that file in Casual Jack. Interesting. The only other mod I have installed is the SP controller support mod. Is there any way that could be messing with this and if so how would I fix it? Oh and I've loaded the file several times from the .zip file straight into the directory so there is definitely no question that I have the correct file in the folder. And if it was a mount issue then surely it wouldn't work at all. As it is, it works for the first few scenes but not the docking scene. I played through further in the game and it also works for the Jack in Purgatory scene, so the issue is definitely limited to that one scene. "And if it was a mount issue then surely it wouldn't work at all. As it is, it works for the first few scenes but not the docking scene." - Incorrect, a mount issue is dependent on the same file being used by 2 different mods and one mod's version of the file 'over-riding' the game from utilizing the other mod's file, it would not make the entire mod unusable. "I even tried deleting the default file for Jack in the game's main directory and replacing it with yours in order to 'force' it, and it still didn't work. " Interesting, I didn't realize that regarding the mount. Still, since the only other mod I have installed is the SP controller mod, I can't see how that would affect his one scene. "Do not, under any circumstance, do this. AT. ALL. This practice of file replacement is not intended to work with DLC-mod's and will most likely break the mod instead"
Installed the game twice now and the same thing happens each time. Very odd. This is a great mod!!! however, after the first area with Jack, for me she reverts to her vanilla outfit. 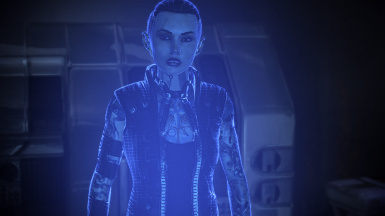 I do not have the Casual Liara mod, though I do have the Casual Javik Mod. Does that cause any problems? It was only the final run for the shuttles, save Rodriguez and chat in the shuttle scene, but I was sad that she was not in her alternate outfit. I have the exact same issue as you. No other DLC mods installed. 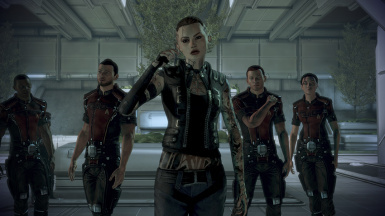 The mod works fine for the first half of Grissom Academy but when you reach the final area her default toilet paper outfit comes back. Really disappointing. I find it weird that it's only you and I who appear to be having this issue, for everyone else it either works or it doesn't. Odd. Just used this mod and it's great! Thanks for creating it. Any chance of a high-res update? Would make it seem less out of place with 'a lot' installed. For anyone who has used this mod. I am going to put this mod in to my DLC folder before using ME3explorer 3.0 to extract all the DLCs and then build a tree with Texplorer. 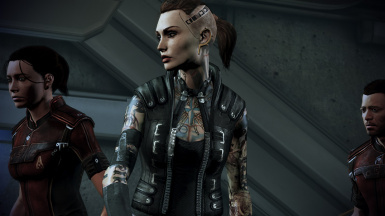 If I then install Jacks 2048/4096 .dss from a lot of textures with TPF Tools, will her face and tattoos use the higher resolution versions with this Casual Jack DLC Mod. I am curious about whether this worked or not. Did it? It should work. a lot is designed to overwrite DLC textures. As long as AVPen didn't change the base texture for the tattoos, a lot should overwrite it. Also, I believe that AVPen is a contributor to a lot, so I'd be shocked if these were not compatible. ( http://www.nexusmods.com/masseffect3/mods/369/? ) such that Jack's clothes still stay the same. The Liara mod works the same as this one: as a DLC to just pop it into the DLC folder so I really don't know what seems to be the issue. It's a DLC priority mount issue, I'm guessing that the Liara mod is using the same DLC mount number as Casual Jack (generally in ME3 DLC, there's a mount priority # which they use, in case a newer DLC is using a modified version of an existing game file like a level or the Coalesced). If you use Mass Effect 3 Mod Manager, there is a pretty user-friendly way to change the mount priority. Select the mod you wish to change (you might have to import it from your DLC folder, that can be done through the Mod Management tab), go to the Tools tab > Mod Development > [Mod Name].dlc files > Mount.dlc [Mod Name]. One of the options on the new tab will be Mount Priority, simply change it to a nearby available priority (which can be found on this page https://me3tweaks.com/mods/known_dlc_mods ) and then apply the mod. I, personally, set the Liara mod to 3904, since it's the nearest available slot, and is less likely to change how it interacts with other mods. It's a crowded slot, though, so no promises that a future DLC mod won't snag it. Also, keep in mind that I haven't fully tested this method, and there might be something I'm missing, but this SHOULD work. As somebody who romances Jack, I heartily thank you for this mod. Endorsed. 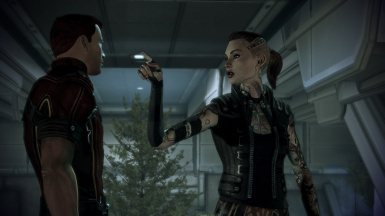 For some reason ME3 Mod Manager refuses to recognize the mod when you try add the mod to it.